When it comes to comparing emergency notification systems, the biggest factor is performance. The answer to this question is going to depend on a few things, but first when comparing two solutions, make sure you’re comparing apples to apples, and not apples to oranges. Emergency notification systems come in many different varieties and not all are created equal. For example, mobile-only alert systems have limitations that a combined on-premises and mobile solution does not, namely the ability to reach on-premises devices. That’s where InformaCast stands out. We offer three solutions to cater to a variety of needs, including InformaCast Advanced to reach on-premises devices, and InformaCast Mobile to connect with mobile devices. But InformaCast Fusion is where we really set ourselves apart from our competitors. It’s the only emergency notification solution where users can manage all their user information, devices and messages from a single interface. This maximizes the speed and reach of an organization’s emergency notifications, meaning they are more likely to reach 100 percent of their population with critical information. It also means organizations only need one vendor, as opposed to multiple, so they can avoid the headache of logging in and out of multiple systems. 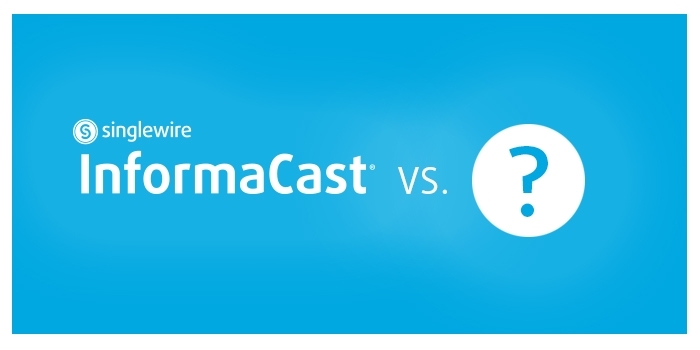 The other way InformaCast differentiates itself in terms of performance is by broadcasting to phones rather than calling them in the event of an emergency. Many systems will say they can reach landline phones, but placing a large number of calls simultaneously often results in many of those calls failing to get through. Organizations have a limited trunking capacity for calling, so when a mass number of calls are sent, many of the calls will be blocked because the trunking capacity is insufficient. Even if the trunking capacity is sufficient, if an organization is large, hundreds of simultaneous calls may be seen as an attack on the system, which would again result in calls being blocked. InformaCast Advanced and InformaCast Fusion handle this very differently. For Cisco phone systems, InformaCast sends a single multicast audio stream across the internal network and the phones play this audio stream via their speakers or the handset. This uses zero phone trunk capacity. There is no need for the end user to answer the phone because InformaCast automatically broadcasts the audio via the speakerphone. When it comes to a tech solution, the support a vendor can provide can make all the difference between a positive experience and a negative one. We can’t speak to the support other vendors provide, but we can outline the benefits InformaCast users have available to them. Users with active software maintenance contracts or InformaCast Mobile subscriptions have access to our dedicated support team, which they can reach by phone, or by opening a help ticket online. Our knowledgeable support staff is often lauded by our users for their quick responses to issues, and their dedication to solving every issue, no matter how challenging. It’s one of the reasons Singlewire is the highest rated emergency notification software provider on G2 Crowd. InformaCast users also have access to the Singlewire Support Community. This resource offers downloads, user guides, video tutorials and more for an easy, one-stop reference point for all things InformaCast. It’s regularly updated with new topics related to software updates and solutions to issues users are running into. Perhaps the most distinguishing feature is users’ ability to connect with one another and share their experiences and successes using InformaCast. The Community has an active forum where users can post questions that are answered by our support team or other users. This offers the opportunity to share knowledge and best practices so everyone can get the most out of their InformaCast system. In addition to our support team and the Community, our blog is updated several times a week with fresh content answering frequently asked questions, highlighting features in software updates, and providing readers with more insights about the latest safety and security trends. An emergency notification system is a big investment, so organizations want to know they are getting the best value for their dollars. We can’t provide specific pricing details on other emergency notification vendors, but we can provide some guidance on how we compare to other solutions. One thing that sets us apart from other vendors is the fact we list the price for each of our service levels right on our website. While this pricing guide is not comprehensive, and other factors may impact pricing, this gives potential users an idea of how much it will cost to implement InformaCast. Many vendors make this information difficult to find, or make it so the only way you can find out is by talking to a sales person. So how does the price of InformaCast compare to other emergency notification systems? If you’re a municipality or county trying to notify its citizens via bulk SMS text messaging, InformaCast will typically be more expensive. That’s because InformaCast was architected to reach individuals within an organization via many different methods, whereas bulk SMS text messaging for large quantities of users is a commodity service. InformaCast costs less when you compare it to the total cost of an emergency mass notification system. Most emergency mass notification vendors are focused solely on notifications to mobile phones, and initially, this may seem like the best value. But these systems need to add one or more on-premises alerting systems to extend their reach, driving up the total cost and decreasing the usability. Our InformaCast Fusion offering reaches people on mobile devices, as well as in-building devices many organizations already in place, such as desk phones, overhead paging systems, IP speakers, digital signage and computer desktops to provide added value to existing technology investments. Studies have shown that using these multiple communication channels is critical to improving the speed and reach of the emergency messages, and speed and reach is what makes an emergency notification system effective. One of the biggest ways we distinguish ourselves from our competitors though is our transparency. What we mean by that is we try and give potential users everything they need to make an informed decision. Whether that’s putting pricing on our website, answering frequently asked questions, or being able to demonstrate every claim we make about the abilities of InformaCast, we want our users to feel confident that what they see is what they get. A thorough demonstration, in particular, can provide a better understanding of how a system works. Many emergency notification vendors are built around a cloud-based delivery model, or notification-as-a-service. For most of them, it’s not standard functionality to reach communication devices inside your network, such as desk phones, computer desktops, overhead paging systems and digital signage. They may be able to do it through a third party integration, but it’s not something they do natively, so demonstrating this isn’t easy. However, if you ask Singlewire to show you a particular function of InformaCast, we can, simple as that. Whether it’s a short video on our website, or a 1:1 virtual demo, we put into practice every use case we talk about.